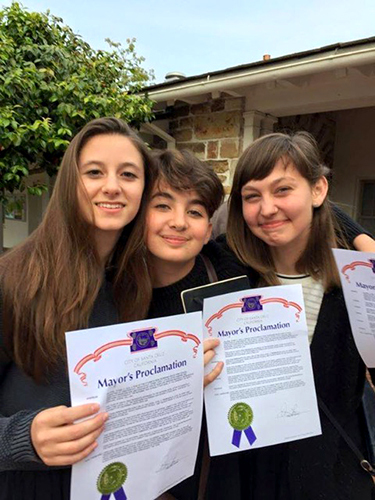 UC Santa Cruz alumna Breeann MacDonald (Philosophy BA, 2015), shown on the right last year with members of the Georgiana Bruce Kirby High School ethics bowl team. MacDonald was an undergrad then and coach of the Kirby team. 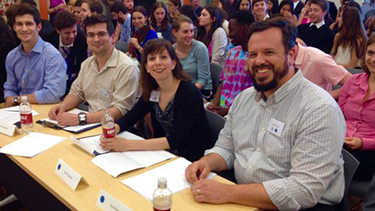 Philosophy lecturer Kyle Robertson, founder and director of the Northern California High School Ethics Bowl, (right) served as a judge at a recent Ethics Bowl. Hosted by UC Santa Cruz, the event serves as a qualifying regional for the National High School Ethics Bowl, where the winner goes on to compete against other regional winners from around the country. The Ethics Bowl is a collaborative yet competitive event--more nuanced than debate--in which teams are presented with a series of wide-ranging ethical dilemmas, asked to analyze them, and then judged on the basis of their analyses. "In other debate formats, the goal is to convince the judges you're right," notes philosophy lecturer Kyle Robertson, founder and director of the UCSC event. "In Ethics Bowl, the goal is to convince a panel of judges that you've thought well about the cases." The ethical dilemmas used in a high school ethics bowl range from those particularly relevant to young students (questions about cheating, plagiarism, peer pressure, use and abuse of social media, the right to privacy); to political and social issues (free speech, gun control, eco-tourism); and bioethical issues (cloning, parental consent). This year's regional event takes place on campus January 14 at the Humanities Lecture Hall. The 16 cases that will be discussed include ethical questions about birth control and the Affordable Care Act, video games involving virtual and augmented reality, working while sick, online privacy, banning religious garb, and "donor babies." All of the teams participating received their cases and questions in the fall so they could prepare responses with their coaches. The panel of judges includes not only members with philosophy backgrounds, but also businesspeople, politicians, and members of various professions in the community to highlight the fact that ethics is not just an academic subject. The High School Ethics Bowl is one of several events hosted by the Center for Public Philosophy at UC Santa Cruz in an effort to foster a more thoughtful and engaged community of thinkers, particularly in the youngest generations. Directed by associate philosophy professor Jonathan Ellis, the aim of the center is to bring philosophy to broader segments of the public, based on the core value that as citizens in a democratic society, it is our civic responsibility to make choices in a well-reasoned and informed way. Other center projects include Philosophy for Children, where faculty and graduate students from UC Santa Cruz bring philosophy to children at local elementary and middle schools, engaging them in sustained discussions of philosophical questions; and Philosophy in Jail, where inmates at local correctional facilities strengthen their skills of reason, deliberation, and communication through supervised discussion of contemporary ethical issues. High school ethics bowl coach and UC Santa Cruz alumna Breeann MacDonald (Philosophy BA, 2015) is also a strong advocate of the program. "I’ve seen this light, I see the students go 'wait, I get to decide why it's good, if it's good'…I think we send a lot of kids out of high school just ready to accept what already is, rather than try to change things,” said MacDonald. This event is sponsored by the Institute for Humanities Research at UC Santa Cruz. Visit ihr.ucsc.edu for the full event schedule. For more information about the Northern California High School Ethics Bowl, contact Kyle Robertson at kxrobert@ucsc.edu. 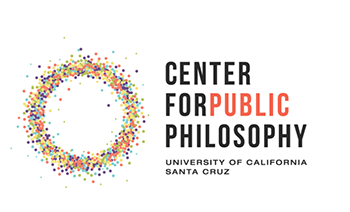 To learn more about the Center for Public Philosophy, contact Jonathan Ellis at jellis@ucsc.edu.